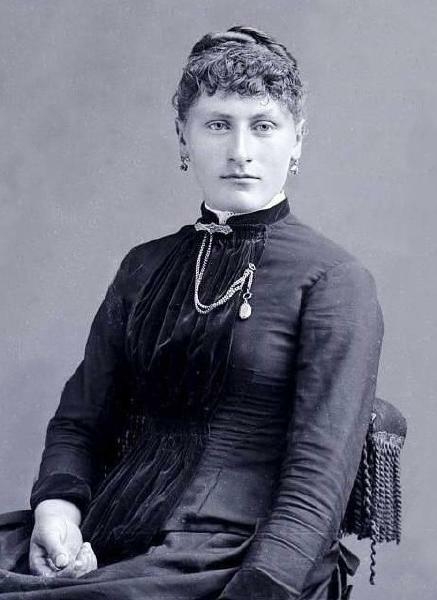 Katherine Adam was born on 17 November 1868 in Hessen-Darmstadt. Jacob Adam and Katherine Becker arrived in the Port of New York on 20 September 1879, accompanied by Katherine Adam, Elise Adam, Anna Adam, John Adam, Jacob Adam and Peter Adam from Rotterdam aboard the SS W. A. Scholten, traveling in steerage. She married George Nauth, son of Johann Michael Nauth and Anna Maria Manz, on 15 January 1893 in Rhine, Sheboygan County, Wisconsin, in a civil ceremony, witnessed by Sabine Mueller and Jacob Adam Jr.
George Nauth and Katherine Adam appeared in the US federal census of 1 June 1900 in Rhine, Wisconsin, living near George's brother Michael.. Other members of the household included Peter Nauth, Daniel Frederick Nauth, George G. Nauth, Louis Michael Nauth and Frieda K. Nauth. George Nauth and Katherine Adam appeared in the US federal census of 15 April 1910 in Rhine, Wisconsin. Other members of the household included Peter Nauth, George G. Nauth and Frieda K. Nauth. George Nauth and Katherine Adam appeared in the US federal census of 1 January 1920 in Kiel, Manitowoc County, Wisconsin. The following appeared in a local newspaper: Jacob Adam, an old settler of the town of Rhine, was called to his reward early Monday morning, death being due to the infirmities of old age. Mr. Adam was a native of Hessen Darmstadt, Germany, where he was born June 4, 1841. He married in 1866 to Katherine Becker, and the family came to America in 1879, settling in the town of Rhine, where the deceased lived continuously until his death. His wife passed away nine years ago. He is survived by six children, three sons and three daughters, as follows: Peter on the old homestead, Jacob in the town of Schleswig and John in the town of New Holstein, Mrs. George Nauth of Kiel, Mrs. Lizzie Mueller of Sheboygan and Mrs. Anna Kohloff of Wauwatosa. Twenty five grandchildren and seven great grandchildren also survive him. The funeral was held Wednesday at 9 a.m., with services at St. Peter & Pauls church, Rev. M. Rumpel officiating. Interment took place in the church cemetery. Katherine Adam became a widow at the 19 September 1924 death of her husband George Nauth. The following appeared in a local newspaper: Funera1 services were beld Saturday morning for Peter Adams, 77, who died at his home Wednesday afternoon. The services were held from the S. S. Peter and Paul Catholic church with interment in the church cemetery. /P/ The deceased was born in Germany December 7, 1874, and came to this country at the age of six, and settled in the town of Rhine with his parents, Jacob and Katherine Adams. /P/ November 9, 1910, he was married to Miss Johanna Rietbrock of the town of Herman. The couple spent their entire married life on the Adams homestead farm. /P/ Survivors include his wife; two daughters, Miss Leona, Sheboygan, and Mrs. Reinhold Dennerlein, Johnsonville; six sons, Arno, Town Russell, Gilbert, Hubert, Wilbur and Vernon, at home, and Earl with the U. S. army in Germany; five grandchildren; two sisters, Mrs. George Nauth of Kiel and Mrs. Adam Mueller of Sheboygan, and a brother, Jacob of Sheboygan. Katherine Adam died on 3 February 1961 at age 92 in Manitowoc County, Wisconsin. She was interred at Kiel Cemetery, Kiel, Manitowoc County, Wisconsin.